Portions of this review also appear in our coverage of the standard, day-and-date Blu-ray release, also written by M. Enois Duarte. Specifically, this review features unique Vital Disc Stats, Video, and Final Thoughts sections, while both reviews share The Movie Itself, Audio, and Special Features. For a full in-depth review of the Blu-ray SDR HERE. 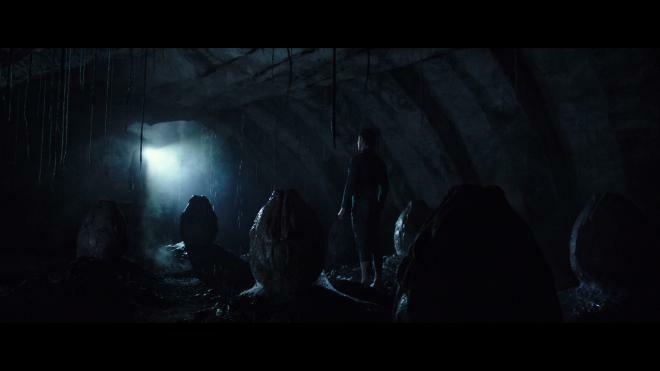 Essentially abandoning the ridiculous, sophomoric pseudo-philosophizing of Prometheus, Ridley Scott returns to direct the sequel to that ambitious but ultimately bloated prequel in Alien: Covenant, a title that even comes across as somewhat apologetic by evoking the original 1979 classic. In fact, Jerry Goldsmith's creepily thematic score is repurposed in this production as a haunting motif suggesting the direction of this particular script. The filmmakers are correcting the disastrous collision course of the previous installment and are finally steering it on track to dock with the familiar, much-preferred storyline that introduced moviegoers to the lethal Xenomorph monster and the iconic heroine Ellen Ripley. This again is where the title change plays a significant role, as the plot feels more like a return to the franchise's traditional horror thriller roots rather than some absurdly heavy-handed pursuit for humanity's creator. By no means is this a great film. However, it is good filmmaking that vastly improves on its predecessor by simply being entertaining while adding an arguably satisfying twist to the alien's genesis. Of course, this will be disputed among those who appreciated the lofty goals of Jon Spaihts and Damon Lindelof's screenplay, likely feeling betrayed by a sequel that basically asks viewers to pretty much scrap the events of the first movie. And in many ways, it does. Rather than continuing on Elizabeth Shaw's obsessed spiritual quest with the coldly indifferent android David (Michael Fassbender), fans are made to focus on the crew of the Covenant en route to colonize the remote habitable planet Origae-6. And this is one of the better aspects because these aren't scientists gloating their particular area of study while making really stupid mistakes. They are the ship's crew, regular people with believable faults, with only one responsibility but sidetracked with investigating a faint distress call, a decision made by the visibly afflicted first mate Chris Oram (Billy Crudup), the new captain after an accident killed his predecessor. This generates tensions with the rest, especially the newly widowed Janet Daniels (Katherine Waterston). Stupidity abounds, for sure, which is an inherent necessity for horror, but at least, it's not caused by people who should know better. Granted, a few are experts of something, but their shared undertaking unites them to a more poignant purpose, one that's been impeded by a neutrino burst, damaging the ship and risking the lives of over two thousand colonists. This is what leads them to explore a remote but potentially habitable alternative. The whole thing feels vaguely familiar, as though audiences have taken similar steps towards to a horrible doom some thirty-eight years ago. Only, the filmmakers have added the awkwardly mawkish device of making the entire crew married to one another, which feels both clumsily forced and cheap to gain sympathies as well as unnecessarily weird. It works at giving the cast the opportunity to overact when spouses begin to die one at a time, but leaves viewers out in the cold. The same can be said of Fassbender playing dual roles as androids: the original David and the newer model with slightly less autonomy, Walter. 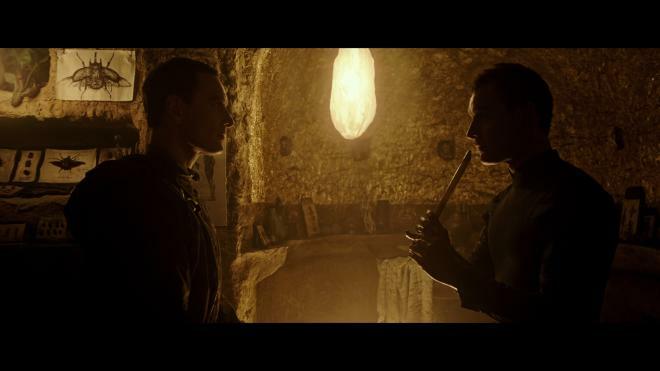 It's interesting to watch the award-winning actor interact and play opposite himself, but at the same time, it can feel heedlessly weighty and a bit dull, as though conceived solely for Walter learning to play the Prometheus theme on the flute. On the other hand, at least the interaction between the two androids leads to something more impactful than their human counterparts, who ultimately serve no other purpose than being fodder. 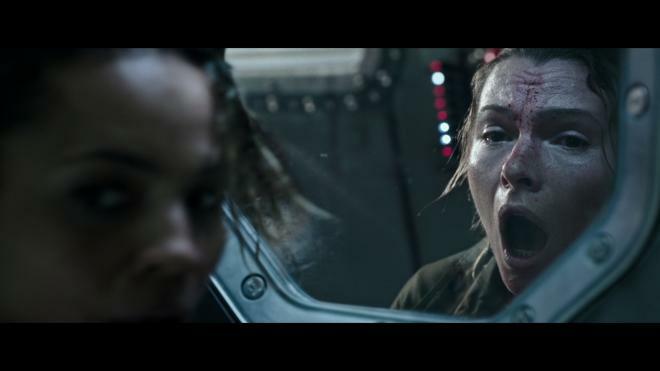 Whereas David's sinister machinations were more implied and suspicious, in Alien: Covenant, the filmmakers make it apparent with his involvement within the franchise's history more shocking, much to the disgruntled moans of some, I'm sure. But the success of this new installment is a return to a classic atmospheric approach to the story, slowly building the suspense and leaving much of what the colonists will discover a complete mystery. The photography of Dariusz Wolski (The Martian, Pirates of the Caribbean series) bathes the entire screen with a gloomy, dispassionate feel that complements Scott's direction, keeping the action tense and effective. Distancing itself further from the first prequel, the film is significantly more violent and gorier, relying more on scares than nonsensical moralizing outside of David and Walter. And this is sure to please horror-hounds, a return to the franchise's genre roots, keeping the plot simple as a straightforward creature-feature. 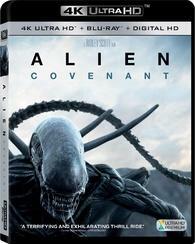 20th Century Fox Home Entertainment brings Alien: Covenant to Ultra HD Blu-ray as a two-disc combo pack with a flyer for a Digital HD Copy, which can be redeemed via FoxRedeem.com but only available in HD SDR and HDX on VUDU. The dual-layered UHD66 disc sits comfortably opposite a Region Free, BD50 disc inside a black, eco-cutout keepcase with a glossy slipcover. At startup, the UHD goes straight to an interactive main menu screen with full-motion clips, the usual options along the bottom and music playing in the background. The Ridley Scott sequel sets forth on a more dangerous expedition to the planet of Ultra HD with a largely impressive and satisfying HEVC H.265 encode. Although not a drastic upgrade from its day-and-date Blu-ray counterpart, the UHD is a notable improvement that better captures the darkly atmospheric palette of cinematographer Dariusz Wolski, and it often looks beautiful. Shot entirely on the Arri Alexa cameras, capable of up to 4K resolution but later mastered in a 2K digital intermediate, the freshly-minted digital transfer retains the creepy textured and heavily stylized photography and even improves on it in a few areas. Brightness levels deliver richer, velvety blacks, immersing the character's and David's temple lair in pitch-black shadows penetrating deep into the screen. However, this also appears to be at the expense of the finer background details where a bit of the production design tends to be lost the darkest portions of the screen. On the other hand, the picture shows excellent gradational differences during many poorly-lit sequences, adding a bit of depth and distance to a few key moments. Thankfully, this isn't a consistent problem, as there remains plenty to see throughout. With a noticeably brighter contrast, viewers can appreciate the welcomed uptick in definition and resolution where they can plainly make out the stitching and threading in the uniforms. 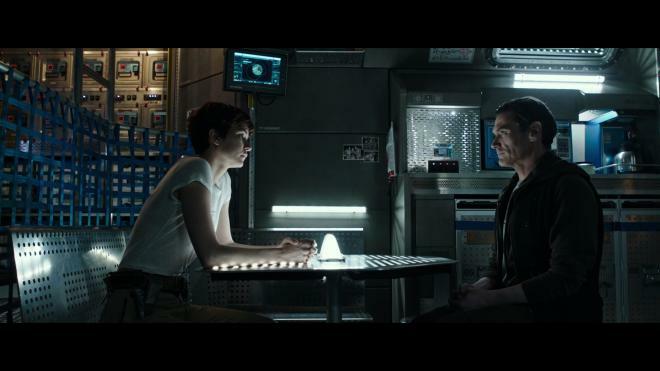 Although heavily subdued and controlled, giving the 2.40:1 image an even bleaker, grayish tone to the planet's downcast environment, whites pop with intensity and a true-to-life spotlessness, particularly in the opening conversation between Weyland and David where the two are chatting in a practically sterilized white room. Specular highlights, on the other hand, are not really any better except for a couple moments where the edges of clouds shine brighter, but some of the light sources tend to bloom a bit harshly and engulf some the finer details. Still, while walking around the planet, the surrounding foliage is continuously distinct from a distance, the lettering on computer monitors and walls is legible from a distance, and the tiniest blemish on the surface of the spaceship is striking. Complexions remain somewhat pale and pasty, but with a little more natural rosiness. Only complaint is that the sharpest edges frequently reveal some aliasing, especially in the monitors. As would be expected, colors are greatly affected by the filmmakers' stylized intentions, noticeably limiting the secondary hues to toned down earth tones and the usual teal-orange palette. However, the 2160p video comes with a more colorful pop in the orange, green and blue-lit computer monitors. In fact, what looked like blue lighting of the ship's interior and from the monitors in HD SDR now looks more turquoise or teal, which oddly seems more natural too. The yellow in some of the spacesuits and the ominous glow from David's lamps are also more luminous and lifelike. Primaries, too, are somewhat richer and fuller, such as the bit of blue sky of the planet and the blood interestingly comes in a darker, gooier shade of crimson. Along with the 4K video, Fox equips the sci-fi horror flick's journey into UHD with an awesome, demo-worhty Dolby Atmos soundtrack that continuously immerses the listener and pulls them into this dark, creepy world of Xenomorphs. Much like its DTS-HD counterpart, the digital beeps computers are heard in the background and the hollow metallic pings echo all around with superb directionality, lightly bleeding into the ceiling speakers. While exploring the planet, the surrounds seem to be used more frequently than before, generating an eerily effective soundscape. The leaves of trees rustle from the blowing wind, and the cracks of thunder are loudly heard overhead. The storm itself also seems a bit more threatening, reminding viewers of the potentially hostile conditions of the planet. But the best moments are those with rain or water falling from the ceiling of David's temple lair, as individual droplets come pouring down from above. In the climatic final quarter with the alien, the debris from the battle distinctly and effortlessly pans into the overhead channels, showering down the sides, rears and in every direction. For a majority of the runtime, the design is incredibly subtle but very well done and incredibly satisfying while tensions slowly escalate and the screen suddenly erupts into action-mode. While the mix of familiar musical motifs and Jed Kurzel's new score fill the entire soundstage with minor bleeds all around, imaging continuously feels expansive and spacious. And with the added front heights, it feels all the more broad like a half-dome wall of sound. Various effects travel flawlessly with discrete accuracy between the channels and off-screen, providing the visuals with an outstanding sense of space and maintaining extraordinary crystal-clear clarity during the loudest, ear-piercing segments. The dialogue and constant yelling is never drowned out by all the ruckus, and the low-end delivers a powerful, hearty rumble to the spaceship's engines and the explosions. Audio Commentary: In a rather dry and monotone voice, director Ridley Scott shares his thoughts on the movie, its place in the franchise, the stylized visuals and his creative decisions. Master Class: Ridley Scott (HD, 56 min): Ignoring the somewhat misleading title, this hour-long documentary is actually an in-depth look at the making of the film and broken into four parts that can be watched separately (Story, Characters, Setting and Creatures). Featuring a host of cast & crew interviews interspersed with tons of BTS footage, viewers can learn a great deal on the director's creative style and approach to the plot, the characters, the visual effects and the shooting location. USCSS Covenant (HD, 17 min): Three more individual pieces that work as a faux advertisement for the latest android models, a roundtable discussion, or found-footage of the crew before cryo-sleep. Sector 87 - Planet 4 (HD): Three segments providing some exposition and background to the plot. Deleted Scenes (HD): Collection of twelve excised and extended sequences. As though finally correcting the disastrous collision course Prometheus was heading, director Ridley Scott steers Alien: Covenant back on track to dock with the familiar, much-preferred storyline introduced in the original 1979 classic. Although still loosely connected to its predecessor, it essentially abandons the bloated ambitions of the first movie and returns to the franchise's traditional horror thriller roots. It's not a particularly good movie, but it's well made and entertaining enough to deliver a few gory thrills. The sci-fi horror sequel explores Ultra HD with a beautiful 4K presentation and a demo-worthy Dolby Atmos soundtrack that's heavily stylized and effectively subtle. With a healthy selection of supplements for fans to enjoy, the overall package is recommended for fans and those hungering for more HDR/3D audio goodness.